Last year a friend of mine advised me to find a hobby where I used my hands. I was feeling a bit stressed and down and not sure why. Another friend was encouraging me to learn to crochet. So I decided to give crocheting a try. I started with a few wash cloths and even a case for my itouch (that turned out a bit too big). Then I tried a few baby gifts of little girl head bands and baby ballet shoes. The next thing I know I had decided to crochet a lego blanket for Big D who absolutely loves legos. 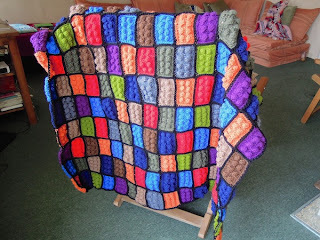 The idea came from Bright and Beautiful who had made a baby lego blanket. So I started with yarn given to me by friends but it was not enough. Then my mom sent some yarn from the states but that was not enough. Next on vacation in Spain, we explored back streets looking for a yarn store that my friend had recommended. Finding it, I again restocked and kept crocheting. Two hundred and eight blocks later, Big D and I laid out all the blocks and I started crocheting them together. Luckily I have been on Spring break and was able to finish the blanket. It wasn't as big as I had originally planned but makes a great throw blanket. Even though Spring is in the air, Big D is putting it to good us already. Here are some lessons I have learned the past 8 months as I have been working on this project. 1. My friend was right. Crocheting was relaxing and restful. It helped me slow down at least for a few minutes. But I may wait a month or so before starting a new product. 2. Sometimes the finished product doesn't turn out how you thought it would but that is okay. Sometimes that is good. Just a reminder that God is working on me and I have no idea how the finished product will look. I do know since it is God's work that it will be a good. 3. Along the way I had different people who were skeptical that it wouldn't turn out. I wasn't quite sure but I knew my plan would work even if I had to tweek it a bit here and there. In life, we will often have skeptics about many things. How we parent, how we teach or even how we do ministry. It is always important to listen to the skeptics and learn but to keep going on the plan God has for us. 4. When working on this blanket, I learned a lot about yarn. Different yarns have different thicknesses and uses. So when getting more yarn, it was important to get at least close to the same thickness. I didn't get it absolutely right but thankfully the yarn was giving enough to where the blanket turned out still. Just a reminder of how life always works better with a little give and take. 5. 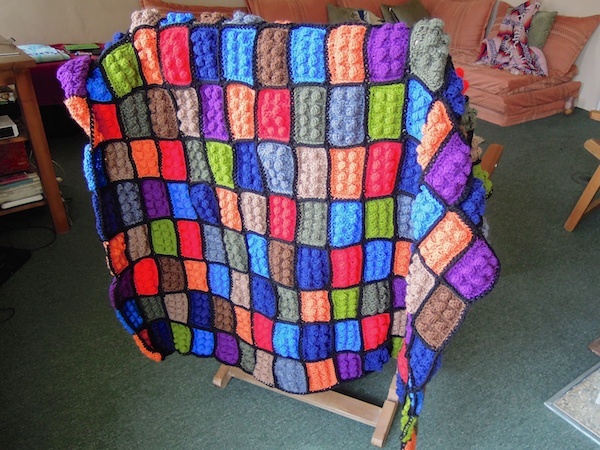 Until the blanket was complete, we weren't sure how the colors would all work together. Big D and I agree that the colors somehow all worked together even though some blocks are brighter than others. God in his providence made us all different colors that make up his church. I find that God is always putting people in my life, I wouldn't have necessarily chosen but have been a perfect fit for what we both needed. 6. Lastly, I find that crocheting helped me listen better. I am a better listener when I listen without thinking about what my response will be. Now if I can just do that without my hands crocheting.